For months I have been mentioning seeing signs that inflation is perking up. This is seen directly in the prices of commodities as they are coming back to life after severe multi-year downtrend. Taking a look at wheat as an example, it’s easy to see its price peaked back in 2012 and has fallen almost 60%, bottoming in late 2016. 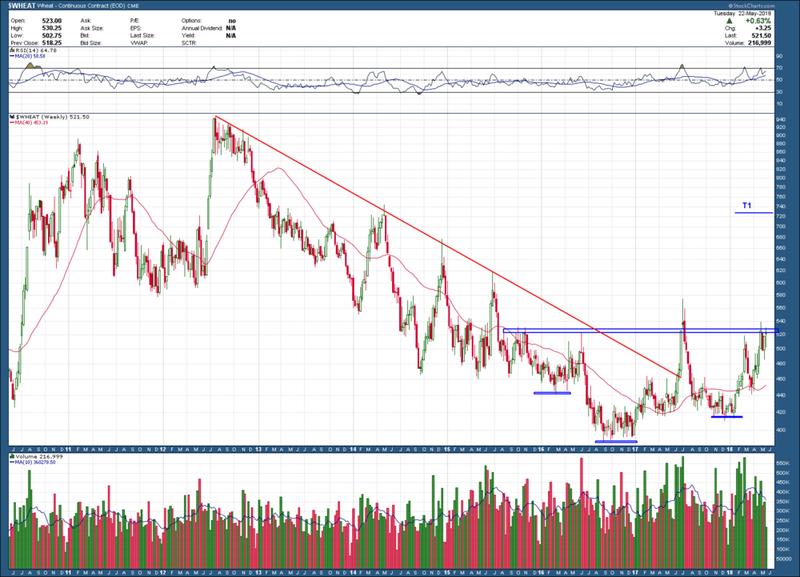 Since then it has been consolidating sideways, eventually breaking above the red long-term trendline mid last year. The 2-year (so far) sideways consolidation has formed a fairly symmetrical inverse head and shoulders reversal pattern with price now sitting above a rising 200-day moving average and just under the pattern’s neckline. If in the next few weeks/months price were to confirm the pattern by breaking above the neckline on increased volume, its upside target is near the 730 level (indicated T1 above), a 35%+ increase from where it sits today. In spite of a relatively ideal reversal investment set up that has developed on wheat, I still wonder whether this is the real deal. Even though this provides a remarkable 7:1 reward to risk ratio because so many commodities have provided false breakouts over the past few years I have become somewhat jaded to their signals.